Ahhh I just love this job! 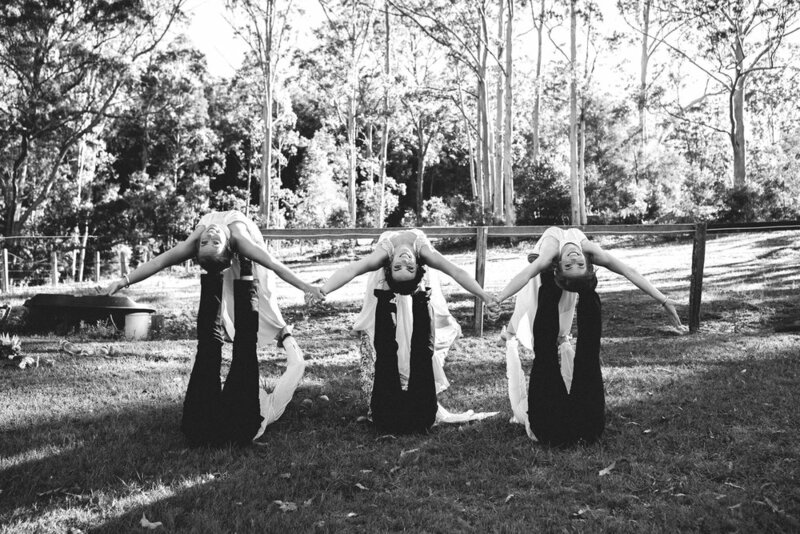 Putting all the pieces together to make a couples day all the more beautiful is so fun! Max approves of the food! Arm in arm these cuties on their way to the ceremony! 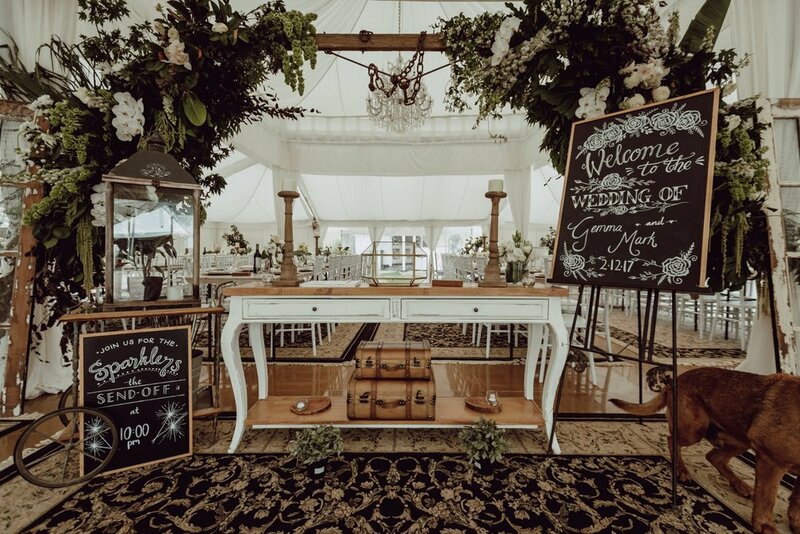 Our Dance marquee looking both rustic and comfy! 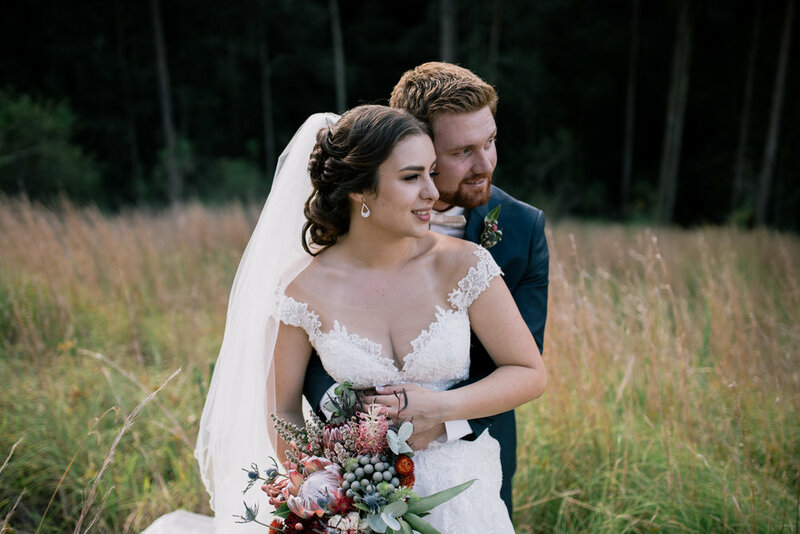 Ahhhh I just love when I find photos like these from our couples weddings at Fernbank Farm....they are a wonderful reminder of how special it is to share in such a happy moment in two people's lives! 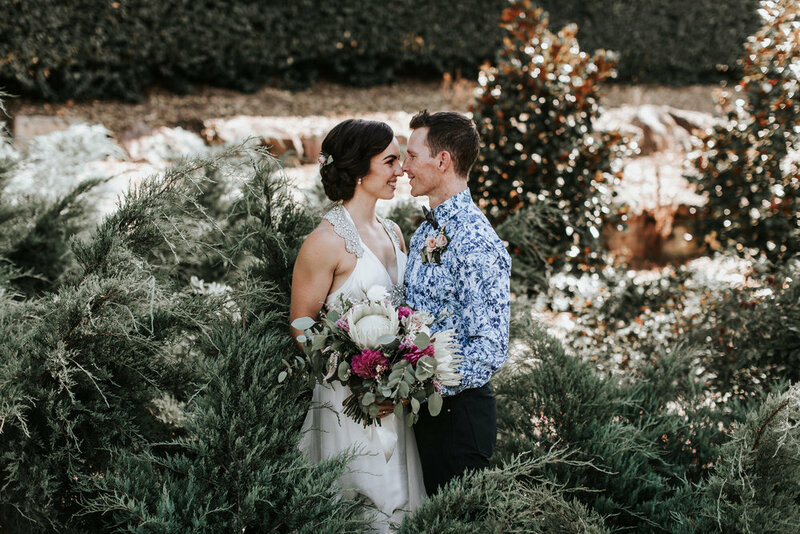 It all began on a beautiful Summers day, the horses were adorned in their custom bridals and the flowers were hanging from our rustic chandelier under the Fig Tree. The Lake Edge was set with our long marquees, flowers hanging from the rafters and fairly lights strung on the beams making for what will be a magical evening! 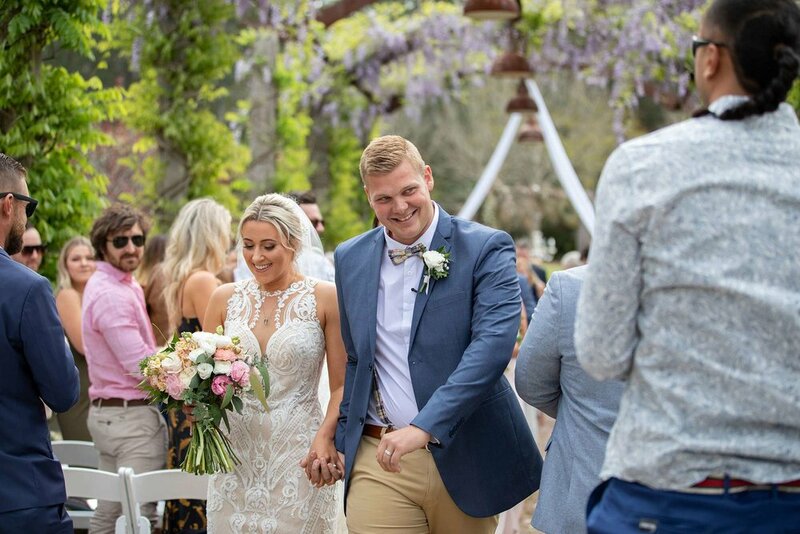 It all sounds too good to be true and its almost as if I'm about to talk about a great wedding catastrophe but nope...the day was a perfect day...one we at Fernbank were very glad to be a part of. OOOOO Where do I start! 1. 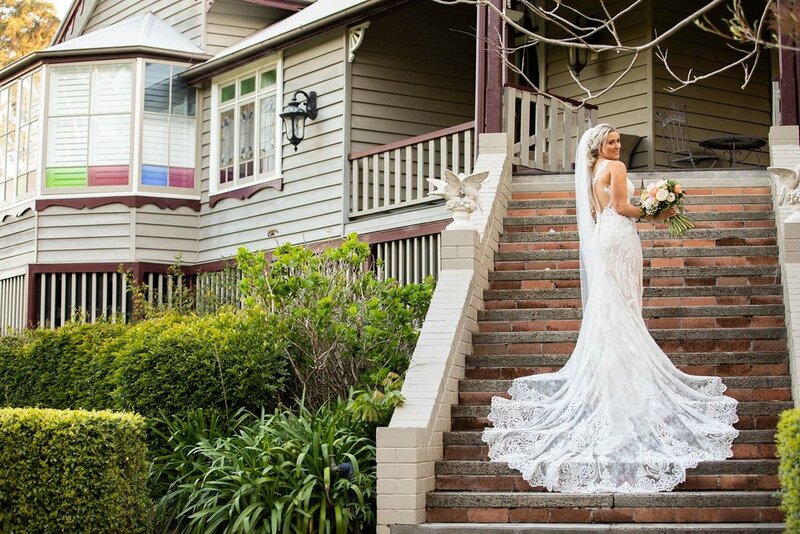 The beautiful bride rode up on horseback to meet her groom after an Aboriginal smoke ceremony was performed. 3. Karl brought his amazing Cube (as per below) for all the gymnasts to play in! and the list goes one!!!!! 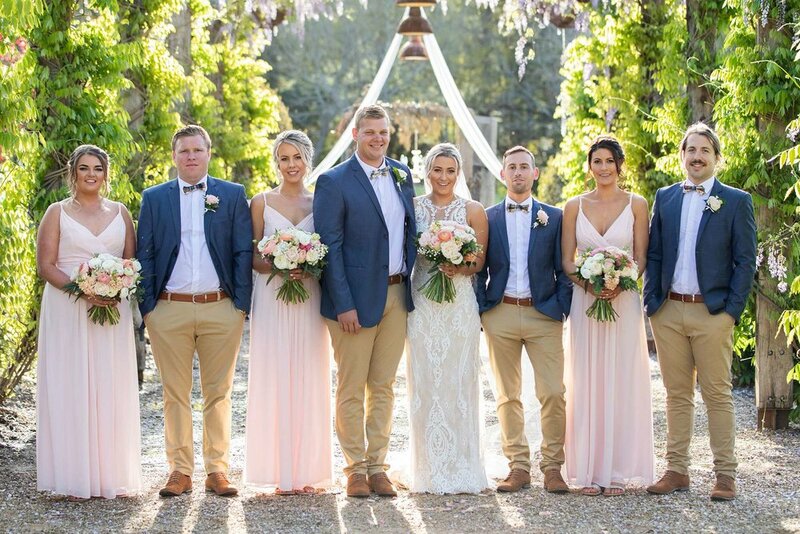 A stunning (and very hot) sunny day greeted Jack and Prudence for their wedding at Fernbank Farm. Their two very dapper little boys led the procession in chino's & suspenders with Prue's bridesmaids in elegant black fish tale cocktail dresses. There were garlands of greenery by the brides sister which looked amazing and a cute little idea by the bride for a menu display on one of our vintage mirrors. 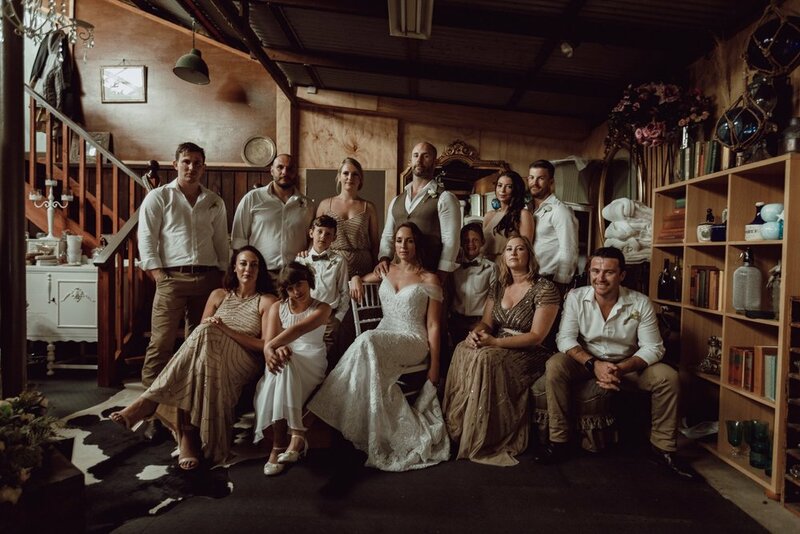 All the teddy bears would be jealous of this stunning picnic setting for Amy & Adams wedding in January 2018 with a beautiful glamping tent, food truck, vintage caravan, pallet tables, cushions and a warm welcoming feel their wedding was one to add to the wonderfully unique category. 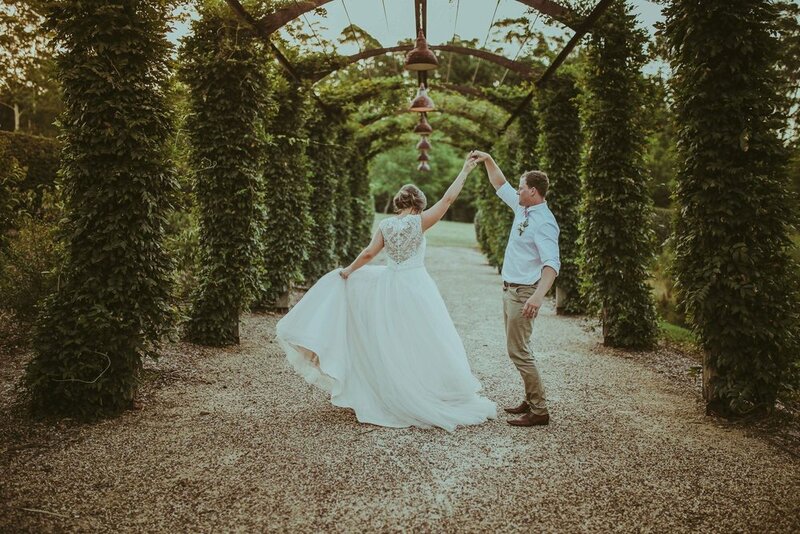 Over a year has passed since Sophie & Corey were married at Fernbank Farm and sometimes photos slip through the cracks only to appear in your inbox to the most amazing reception. 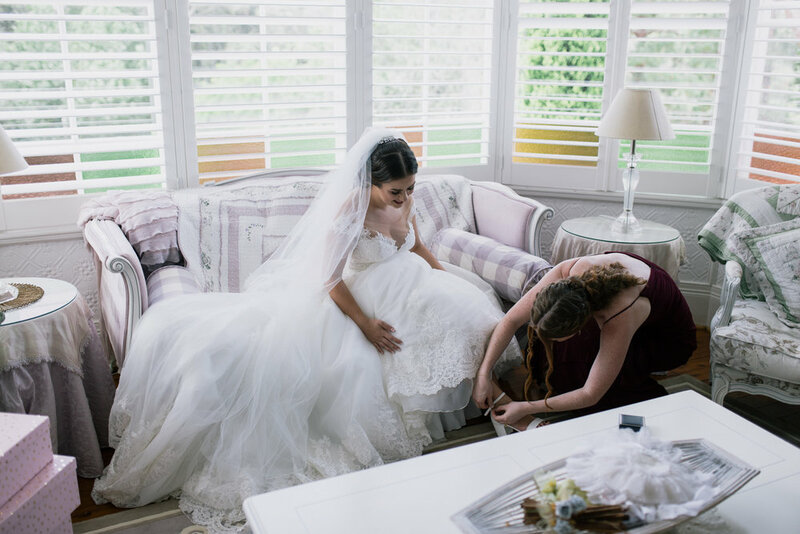 I spent most of this morning perusing through some of the most stunning photos of Sophie & Corey with almost a little tear of joy in the eye and just had to share! 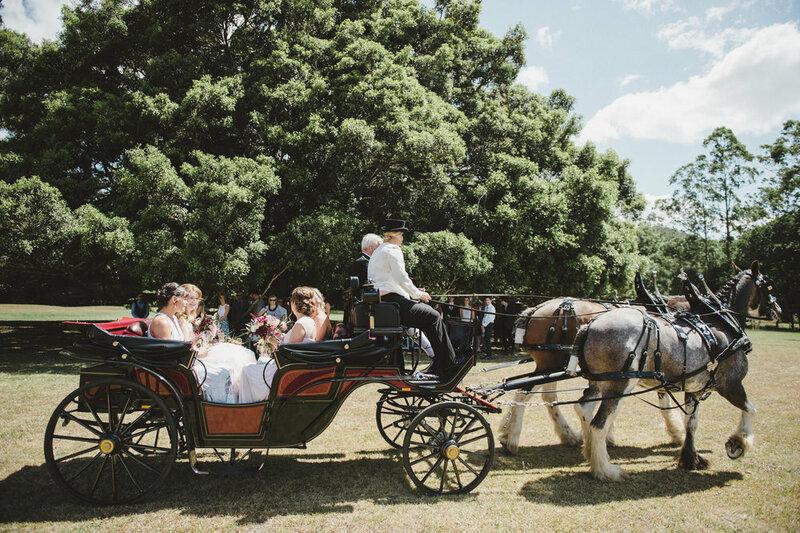 This event had so many moving parts and wonderful elements firstly with the bride was picked up by our beautiful Landau carriage with her father in traditional kilt and escorted to The Fig Tree. Elegant flowers hung from the branches by The Botanical Workshop and Bagpipes Matthew from All Seasons Bag Pipes welcomed the Bridal Party to the ceremony. Sophie & Corey then broke from tradition to cut their cake prior to the reception serving a quaint high tea during the break between ceremony and reception which wasn’t the only treat for guests. 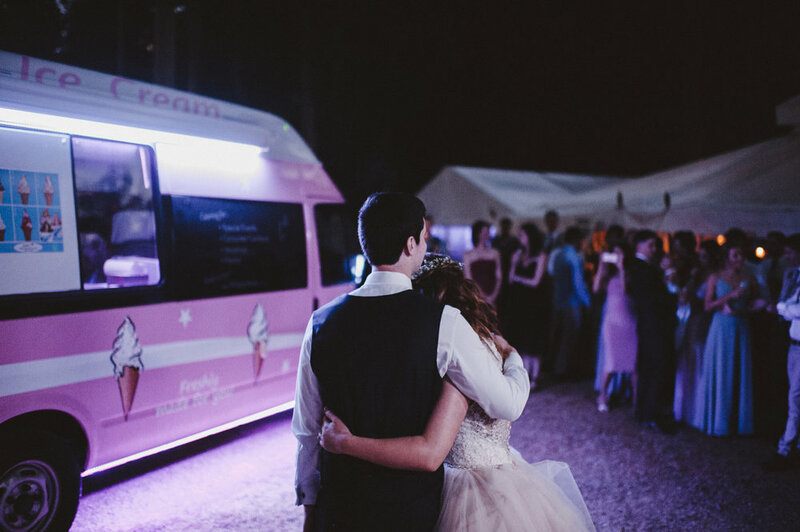 Six piece band Vibe Wedding Band filled the venue with classic songs which was only interrupted by speeches and the fun jingle of the ice cream van arriving to serve guests a cheeky ice cream for a second dessert. 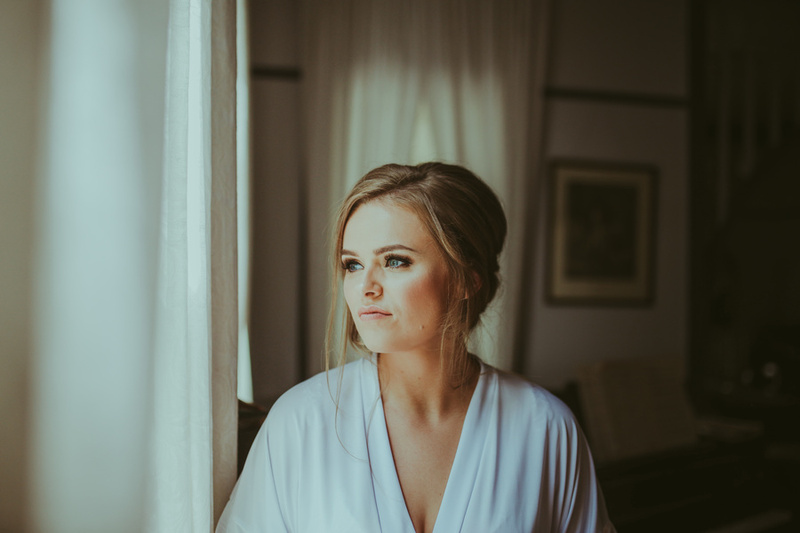 You will agree that the photos are another visual treat by the very talented and sought after Lauren Campbell which are featured through this little blog. 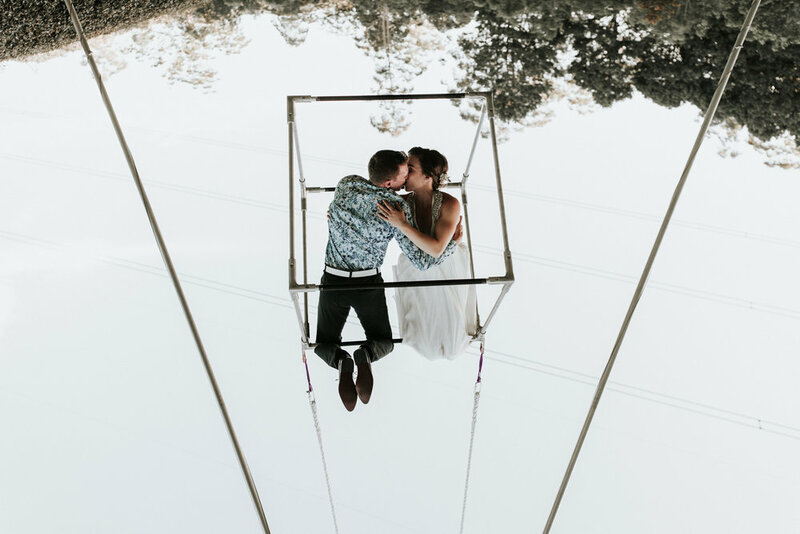 Gemma & Marks "Tropical Paradise"
I want to talk about a "Wise Bride" - what I mean by this is a woman who understands there are just certain elements out of ones control and there is no point worrying about those elements. 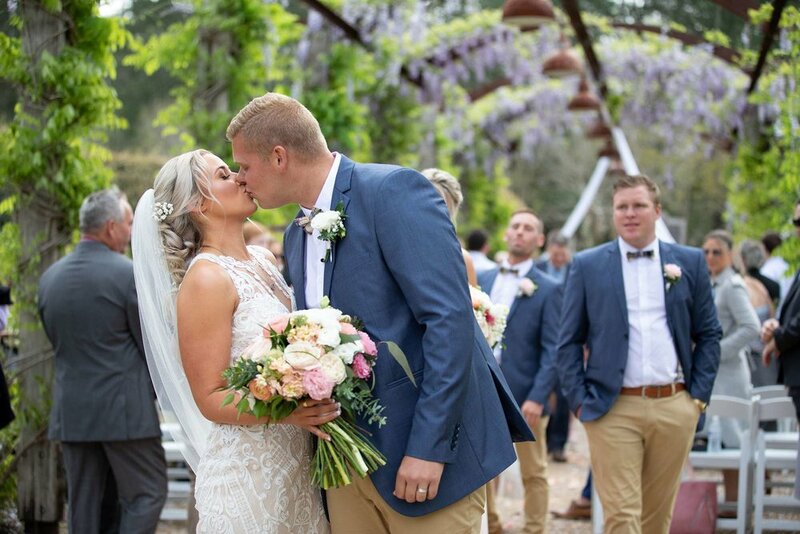 Gemma was exactly that, "wise", on what was one of our wettest weddings for 2017. 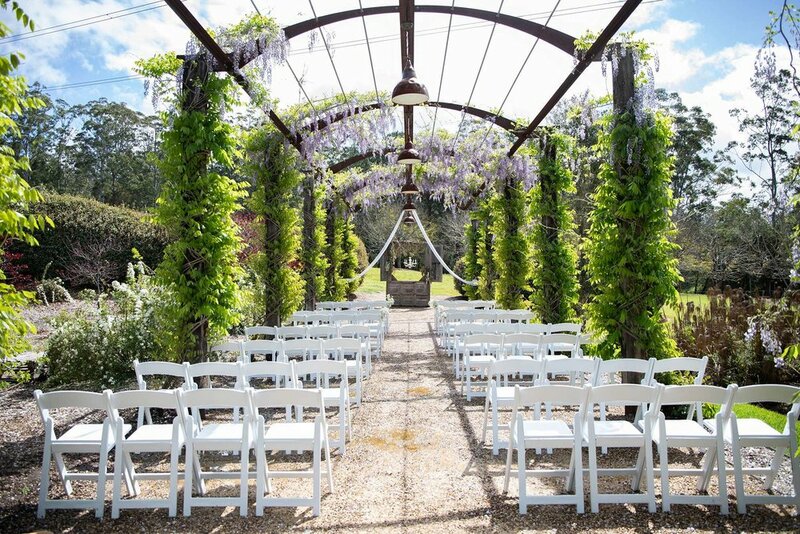 With the forecast looming gloom and doom right before the ceremony we pushed through and crossed fingers, toes and anything that goes, in the hopes that the rain would hold off long enough for Gemma & Mark to have their ceremony in our Arbour. Guests arrived and grabbed a brolly, quickly took their seats to save their butts from getting sloshy (if it rained) and Mark and his groomsman awaited with sprinkles coming and going teasing us into a state of "should we stay or should we go"... "i dunno!" 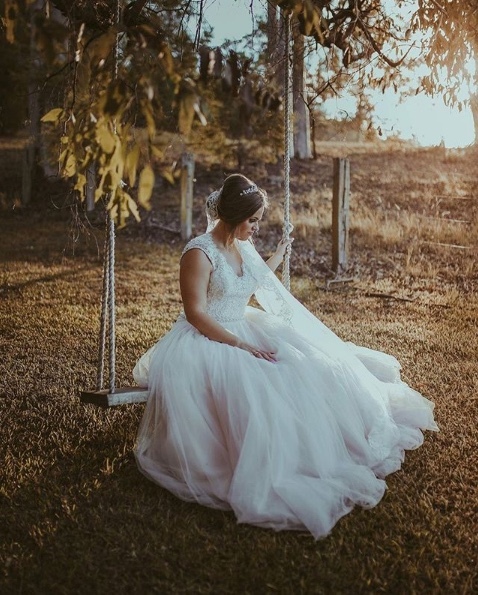 The decision came down to the bride, as she glanced at the sky casually saying "yes, lets move everyone" and pops back inside with the girls to grab a glass of bubbles to calm the nerves and save the hair whilst we moved all the guests to a safe, dry ceremony space. Low and behold the music starts, the bridesmaids' travel down the stairs handing over their brollys at the start of the isle and the beautiful Bride enters The Pavillion just in time. THE HEAVENS OPEN and the rain commenced in a what could be described as a musical shower to open the first lines of the ceremony "WELCOME EVERYONE, to Gemma & Marks Wedding" ...pssshhh...sssss...splish...splash...THAT WAS LUCKY! 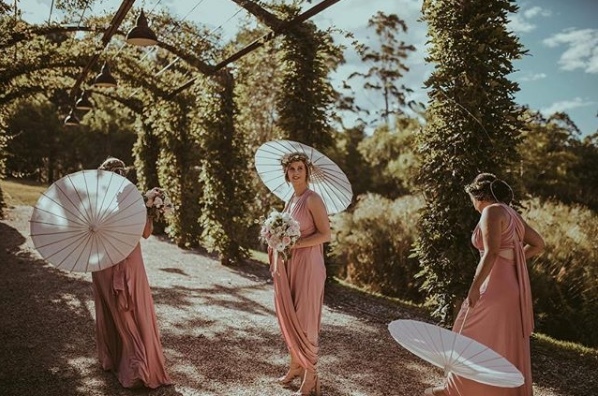 Fitting for a tropical wedding where the day is hot and the afternoon is wet and steamy the wedding was drenched in an array of beautiful tropical inspired flowers by Justine Rose. Orchids, Lily Leaves, Palms and a mix of white florals and greenery draped through the Marquee in the most divine fashion. 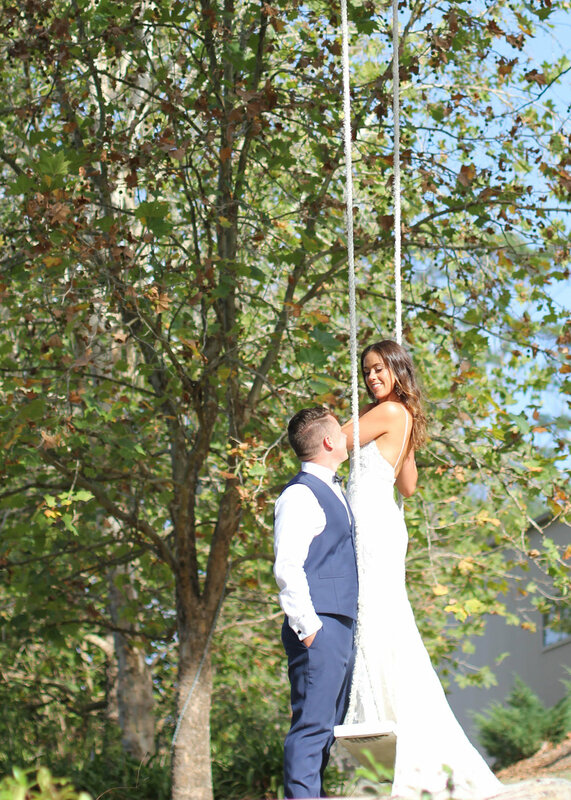 Kaysha & James - "A pop of colour"
When I get photos sent to me from weddings the ones that seemingly make the most impact are the ones that have a little accent of colour. It helps draw the eye to focal areas and gives everything a little more contrast, it doesn't have to be a lot of colour, just a subtle glimpse to make things "pop". I simply loved the highlights of colour in Kaysha's bouquet, on the tables and matching lippy, its pretty, warming and a nice little highlight to a wonderful day. 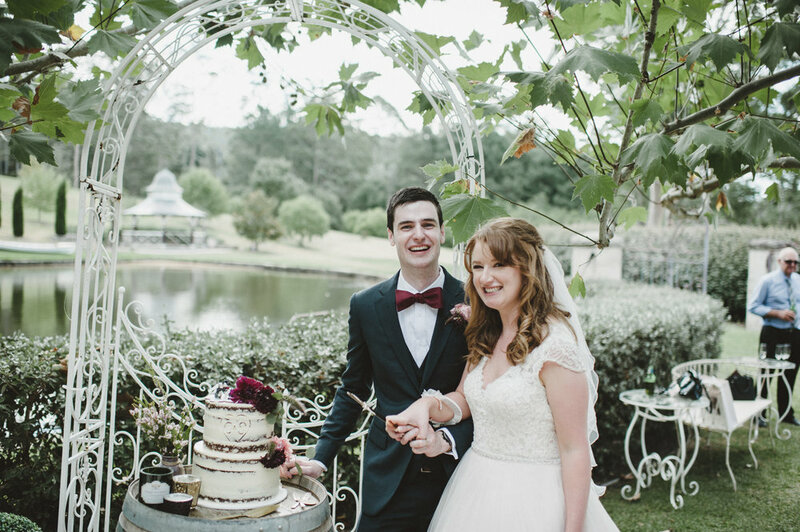 Sam & Chris can only be described as "the sweetest bottle of bubbles" - their kind, excitable and warm personalities were an absolute pleasure to meet and be a part of such a special memory. The day starts off with the normal Hair & Make Up for the girls and the boys have been fishing for the last day in our lake catching Bass & Perch galore. Before the ceremony starts Sam is picked up by two gentle giants Leo and Lola in our Landau Carriage and escorted to The Fig Tree where Chris nervously (but excitedly) awaits. A little hicupp with a rude driver beeping his horn and speeding past the horses doesn't stop the special moment with Tina our driver shaking her head ( or possibly giving the bird) and calmly collecting Sam's steads for the journey. 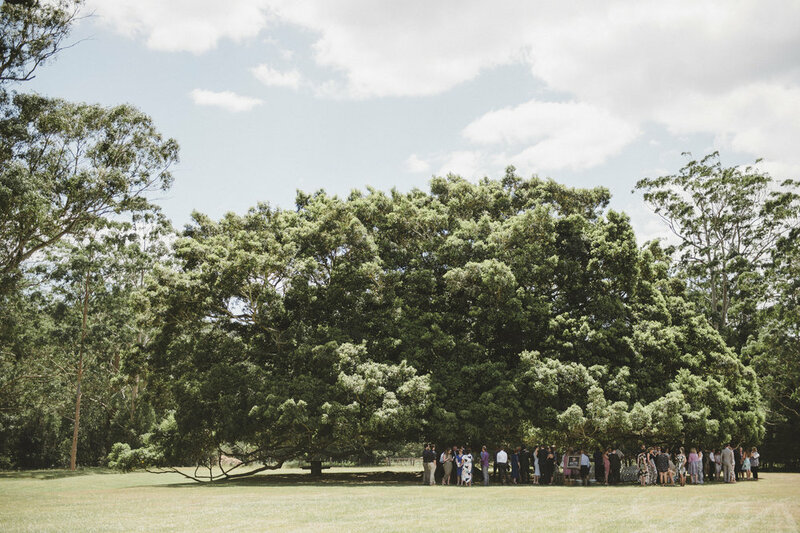 There are tears of joy & many sweet moments enjoyed under the grand canopy of the Morton Bay Fig Tree and hip hip hooray Sam & Chris are now man and wife. The rest of the well weathered day was spent playing games by the lake and eating scrumptious food supplied by Eden Catering in the Majestic Marquee. 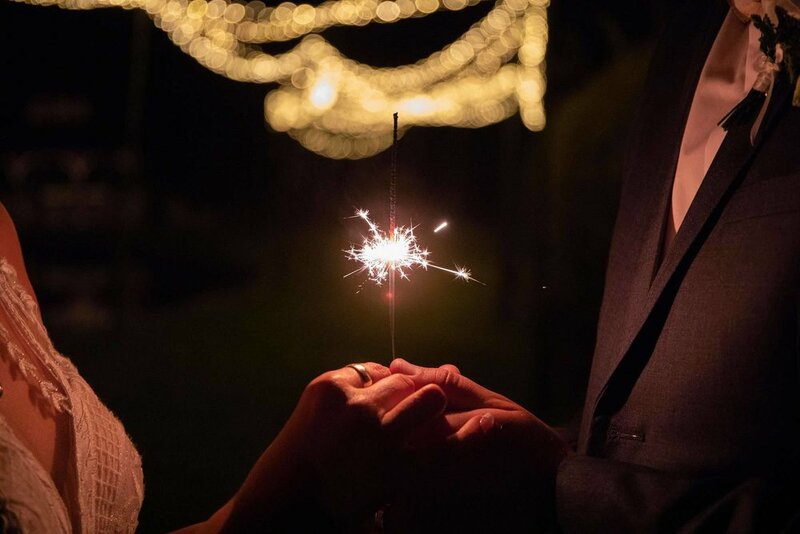 The dance floor was awoken at around 8pm with a gorgeous couples dance choreographed by My First Dance Co and the night concluded under the twinkles of sparklers.